At the heart of Orlando’s attractions is this three bedroom townhome on the luxurious gated resort of Regal Oaks. The Disney parks are just 10 minutes away and you are less than a mile from the US192 which has a wide range of shops and restaurants. King-size bed, ceiling fan, flatscreen TV, slide closet. En-suite bathroom contains a shower over bath, sink unit, WC. Queen-size bed, ceiling fan, flatscreen TV, slide closet. En-suite bathroom contains a shower over bath, sink unit, WC. Twin beds, ceiling fan, slide closet, ground floor. Family bathroom by entrance contains a shower over bath, sink unit, WC. This three bedroom townhome on the gated resort of Regal Oaks is a fantastic base for your Florida holiday. Resort facilities include a pool with water slides, sports courts and a bar and restaurant. You will be able to reach SeaWorld and the Disney parks in 10 minutes, while Universal Studios is only 20 minutes away along the I-4. 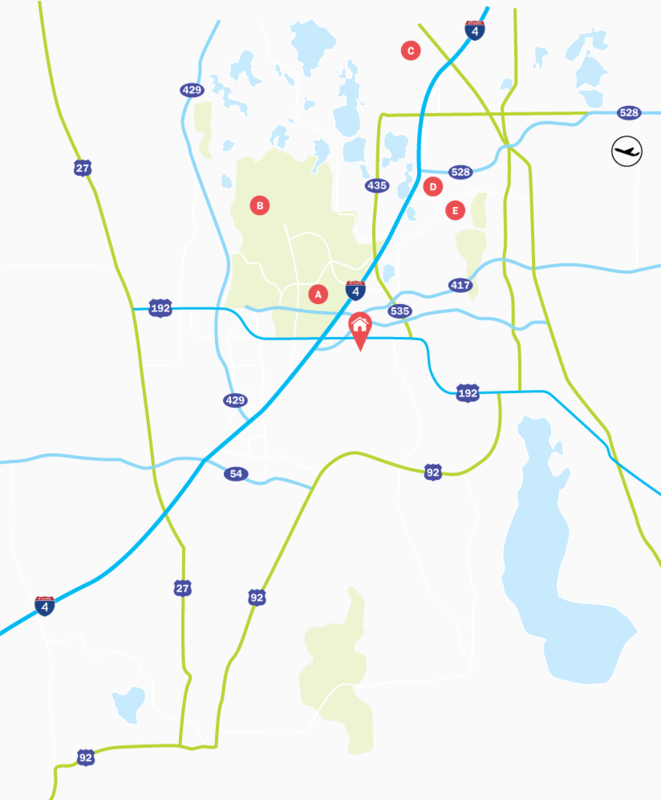 If you don’t fancy cooking, you can walk to the Old Town Kissimmee, or take a trip along the US192 less than a mile away, which has a wide range shops and restaurants to suit all budgets and tastes. Living Accommodation - The dining area is at the front of the property and has a wooden table that will seat six guests. Behind the dining area is the lounge. Here there are two sofas for 5 guests to put their feet up and watch a little TV, or access the back yard area. To the right of the living area is the kitchen which has black appliances and a window overlooking the back yard. Bedrooms - The Master bedroom is upstairs at the front of the property and has a King-size bed, flatscreen TV and en-suite bathroom. Next to the Master bedroom is Bedroom 2, which has a Queen-size bed, flatscreen TV and en-suite bathroom. Bedroom 3 is downstairs at the front of the townhome and has Twin beds. All bedrooms have ceiling fans for the comfort of the guests. Regal Oaks is a modern, luxurious and gated resort situated just off the US192. The resort is home to 2, 3 and 4 bedroom townhouses. Located just a short drive from the I-4, a large array of shops, bars and restaurants and Old Town Kissimmee. Disney theme parks are just a ten minute drive.